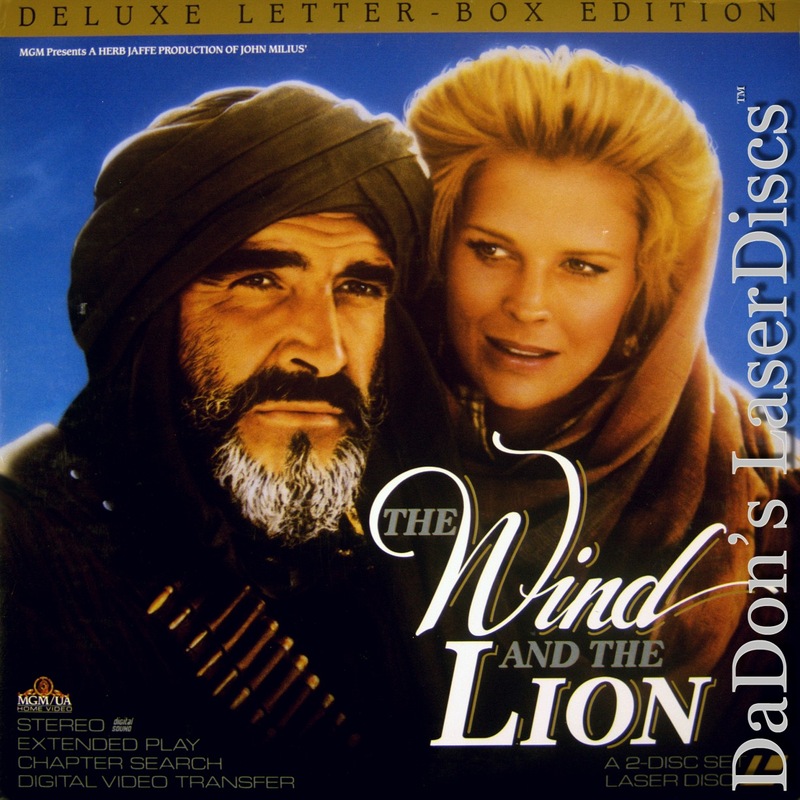 The Wind and the Lion 1975 - 119 min. 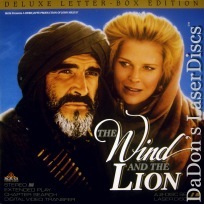 - Color Genre: Action Rated PG Country: USA LaserDisc Movie Storyline: At the turn of the century, a North African sheik kidnaps an American widow and her children in Tangiers, setting off a chain of international incidents. But while she's being held for ransom, the widow finds herself increasingly attracted to her captor. Then, Theodore Roosevelt--with thoughts of re-election on his mind--sends the Marines to rescue them, and becomes entangled in both European and Arabian political intrigues. Academy Award Nominations: Best Sound, Best Original Score. 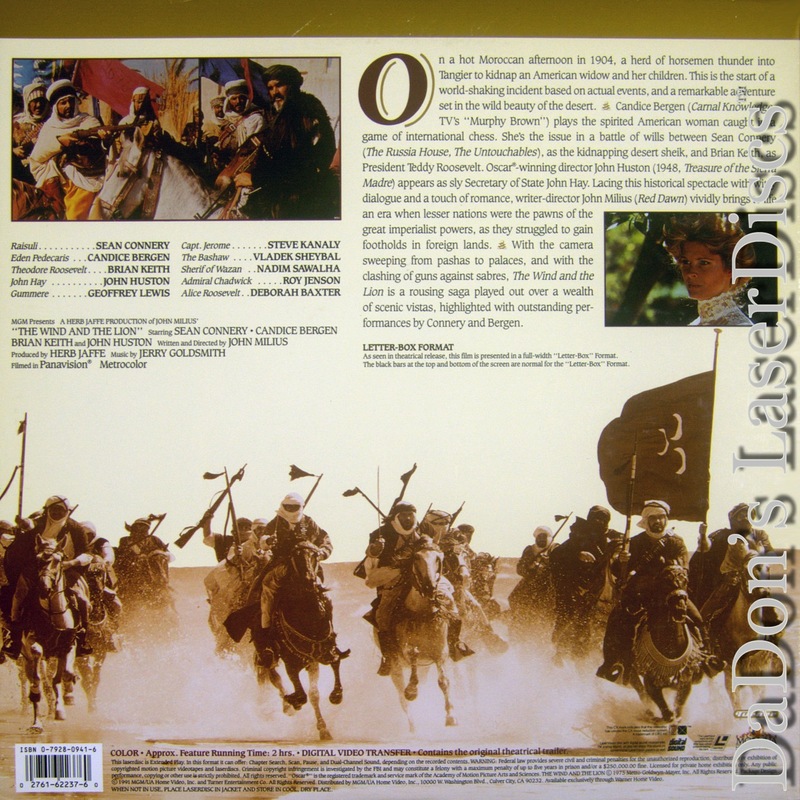 LaserDisc Movie Review: In the early 1900s, an American businessman was kidnapped by a rebellious Arab chieftain, principally as a means to embarrass the Sultan of Morocco. This abduction sparked the threat of armed intervention by President Theodore Roosevelt, which was never carried out. In The Wind and the Lion, the unattractive male captive is replaced by the gorgeous female Mrs. Pedecaris, an American widow played by Candice Bergen. The ruthless but essentially decent Arab chief Raisuli is portrayed by Sean Connery, while Teddy Roosevelt is depicted as a jingoistic blowhard by Brian Keith. The film's main theme, that of America's emergence as a world power, is largely secondary to the growing mutual-respect relationship between Mrs. Pedecaris and Raisuli. After releasing his hostage, Raisuli is himself captured by German forces, who at the behest of the Kaiser are seeking out methods of laying the groundwork for what would evolve into World War I. With the help of Mrs. Pedecaris --- and, in long-distance fashion, President Roosevelt --- Raisuli escapes. Director John Milius' screenplay bears little relation to the facts of the matter, but this is forgotten in the light of the film's dynamic action sequences, not to mention the marvelous rapport between its two main stars. --- Hal Erickson Thanks for Visiting DaDon's Rare LaserDiscs ! Reviews, Articles, Newsletter and Information for Movies on LaserDisc LD Laser Disc, LazerDisc.